Concealing your gun safe is another measure of security and this is one that is actually free, but different safe types, require different hiding places and this will make it harder to hide your gun safe if you do not understand which safe types fit in better in which position. Gun safes are available in different types and sizes and this will help you determine where to place the safe. The mounting equipment of the safe is also included most of the times, but if you need to place the safe in an abnormal location, you might need to adjust the mounting procedure. This hiding place will be perfect for smaller hiding places and even though it does not seem very safe, it will be if you have a sturdy and heavy table that can be bolted to the ground. This will be great for your home office and if you manage to find a safe that can drop open when you unlock it, you will have faster access as you have gravity on your side. The only downside to this is that you will need to drill extra holes in the top of the safe and adapt all of the mounting equipment accordingly. This could be very time-consuming and it might even cost you a few bucks extra to get the correct tools and mounting equipment, but you can be sure that no one will randomly peek underneath your desk. It might seem like a cliché when we suggest that you mount the safe under the bed, but that is why we also suggest that you securely deadbolt the safe to the ground. The main reason for putting a safe underneath the bed is the fact that you will have even faster access to your gun in a time of need and when you are startled, there will be no need for going to the safe. You will need a small, but extremely strong safe and some of the push-button simplex locking safes are fitted with the additional gas strut to help speed up the opening process and even keep the safe open while you are busy getting your weapon. These safe types and concealment areas will be great for people living in a dangerous and violence-plagued community top help give you the added advantage over the intruder and even catch them by surprise. There will be no additional drilling as most safes allow you to mount it to the ground and this could improve your gun safe security and access for free. Intruders like to stake out a home and catch the residents off guard to get inside and get them at a disadvantage. It will not be of much use if the gun is in the safe inside the main bedroom and you might need to keep the gun close by. Many people do not believe in portable smaller safes that can be kept close by and they simply carry the weapon around, but this could be dangerous, especially if you have children. This method is not great when it comes to quick and efficient access, but we believe that gun collectors will find a lot of benefits from this hiding place and they will ensure that their guns are safe. The walk-in safe is still the best, but we like this method for people that cannot afford that large built-in safe door for their rooms. 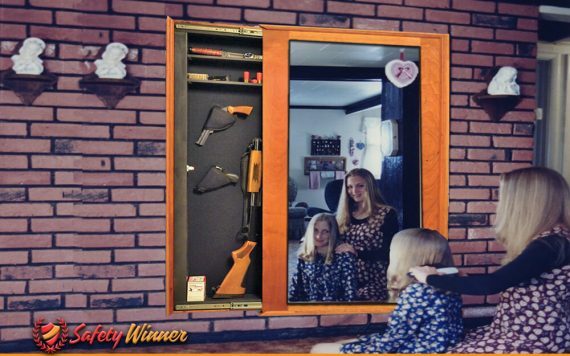 Obviously it is a good idea to conceal your gun safe behind the mirror in your bed-room or wherever you spend most of the time at home. it will also increase the security of your gun and valuables you never agreed to lost. Note: If you own a rifle safe, these hiding places might become tricky, but we have seen cases of people managing to conceal their safes in some weird and uncommon locations. We have chosen these locations for smaller handgun safes and even though they are great for concealment, they will also give you fast and efficient access to the safe in times of need and when danger occurs.